Being a client oriented organization of this domain, we offer a wide range of premium grade Explosion Proof Exhaust Fan. Offered range of sheets is manufactured by our professionals in accordance with the industry laid quality standards and norms. The casing is manufactured from silumin. The fan is driven by specially manufactured Ex motors. The single-phase motors have a sand-enclosed capacitor, which is approved by ATEX. • Glassy finish with scratch proof epoxy coat paint. • Special designed blades for high air delivery. 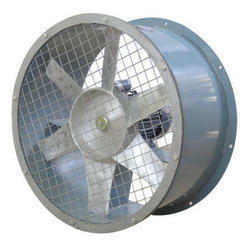 Axial fans, sizes from 250 to 900 mm, air volume (freeblowing) from 900 - 28, 000 m³/h. - Electrical Rating: 5.0 KW/6 HP, 415 VAC, 1440 RPM, 3 PHASE. Keeping in mind the many necessities of the customers, we are occupied in providing an extensive series of Explosion Proof Fans. Certain shipboard areas onboard chemical tankers, oil tankers, gas carriers and special cargo ships have class requirements of spark proof and explosion proof fans. 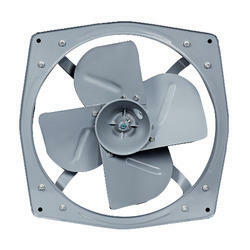 Air control offers a wide range of special fans for installation in this type of areas. Fans are often subject to the harshest wear. Abrasive media that is carried in the air flow (e.g. clinker dust, quartz and also corundum, wood and plastic shavings) attack the material. Products such as Pneumatic air movers, pneumatic ventilators, explosion proof ventilators & many more.